Fantasy readers, don’t pass up this engrossing tale. I ganked the Amazon thumbnail – please don’t sue. 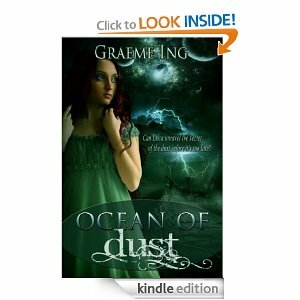 In Ocean of Dust, we follow Lissa, a young girl forced into a life of slavery aboard a mysterious vessel which traverses the world’s oceans. As possibilities of escape diminish, she’s caught in a foreign culture full of strong, conflicting personalities, and strange traditions. Lissa makes allies and enemies alike as she explores the world aboard ship, and struggles to discover the source of the strange influence the ocean itself has over her. What I enjoyed most about this novel was the seamless melding of story and world-building.Ing’s world is unique, well thought out, and wholly alive. Better yet, it’s shown to us at an even pace, letting the reader drink in and absorb the unique properties and physics of the universe as we adventure with Lissa. Colorful characters populate the story, each one with their own distinctive voice and part to play. Many publishers are putting their eggs in the urban fantasy basket, or else staying to the tried and true swords-and-horses subgenre. Ing’s story doesn’t fit easily into either one of these categories, which, for me, made it a welcome departure from the norm. It works as a YA tale, as the characters and plot will be relatable to young readers. I definitely wouldn’t pigeonhole the story as a “YA only” read, though. Adults who have enjoyed series such as Harry Potter and His Dark Materials would be in good company here. The conclusion of the story is satisfying, while hinting at the possibility of returning Lissa’s story to us again in the future. I hope this is the case.